This past December I celebrated my 30th birthday. 30!!! It sounds a lot older than it feels. Initially, I planned for a bike ride...but heavy rain and winds put a damper on that plan real quick. Desperate for something that would allow my friends and I to spend time together, be memorable, fun and unique, I started asking around. 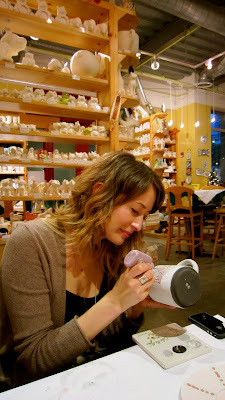 My co-worker Leah gave me the excellent idea to make pottery, which led to the idea of painting ceramics at Color Me Mine. The Color Me Mine in Santa Monica is awesome. The process is super easy. You choose from their wide array of ceramics, then start to paint! We reserved the party room which is a bigger table secluded in the back. 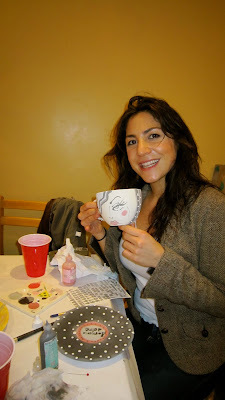 They let us bring in our own wine and champagne so we sipped, painted and talked for a good 2 hours. It's only $10 per person + the ceramic piece(s) you choose. If you look on their calendar they have specials for "Ladies Night" and "Date Night." Super cute idea for a date! Dinner and Ceramics, love it!